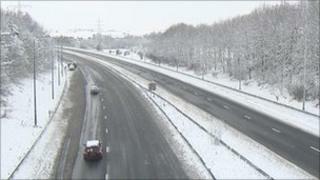 Drivers in Lancashire were urged to take care on the county's roads as the big freeze continued. Temperatures dropped to -15 in some areas overnight and were not expected to rise above -1 on Monday. Brian Hensby, of the Highways Agency, urged drivers to "use their common sense" and to be aware that there could be black ice on the roads. Blackpool Airport was open and passengers are advised to arrive for their flights as normal. There were no reports of disruption to public transport, except Northern Rail services between Lancaster and Morecambe. They have been suspended due to a train breaking down. Snow and ice caused major disruption in Lancashire over the weekend. Hundreds of drivers spent Friday night stranded on the M6 and M61 motorways after a lorry jack-knifed in the snowy conditions. Blackpool's match against Tottenham Hotspur was also cancelled on Sunday.